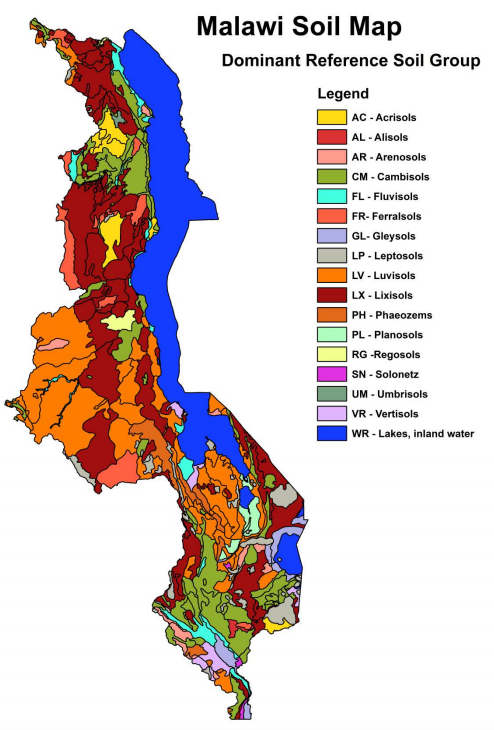 The Soil and Terrain database for Malawi (version 1.0), at scale 1:1 million, was compiled based on the soil map of Malawi at scale 1:250,000 (compiled by the Land Resources Evaluation Project) that was complemented with soil boundary information from the provisional soil map at scale 1:1 million. The 90m SRTM-DEM was used to define the various landform types of the SOTER units and also to adjust their boundaries. The SOTER map units were attributed with soil information obtained from the Africa Soil Profiles Database. The SOTER compilation followed the methodology described in the SOTER Procedures Manual Version 2. SOTER forms a part of the ongoing activities of ISRIC, FAO and UNEP to update the world's baseline information on natural resources.The project involved collaboration with national soil institutes from the countries in the region as well as individual experts. Dijkshoorn JA, Leenaars JGB, Huting J and Kempen B 2016. Report 2016/01, ISRIC―World Soil Information, Wageningen (doi:10.17027/isric-wdcsoils.20160001, with dataset). Downloadable data; ESRI shapefile format and MS Access and SQlite (zipped). 60803da0-a15f-4cc5-9cb5-172fa2460af3 Access to the portal Read here the full details and access to the data.